A Portrait Sitting and 20×16″ Cubit Wall Art for just £135 ! A magnificent 20×16″ portrait ready to hang on the wall. Finished in one of the latest contemporary styles, the black Cubit Frame (brown is illustrated) fits flush to the wall giving a truly modern presentation for your new portrait. Christmas is just around the corner and wouldn’t it be good to have a brand new up-to-date portrait on the wall to be admired by your festive visitors? You’ll enjoy a fun photo shoot at our studio for up to six people (larger groups by arrangement). Or you even add a beauty makeover session! Then all that remains is to choose your favourite and we’ll get the portrait made ready for you to hang. And if you feel you’d prefer something larger than the 20×16″, you pay the difference to upgrade to a larger size – so you’ll still keep the huge savings. 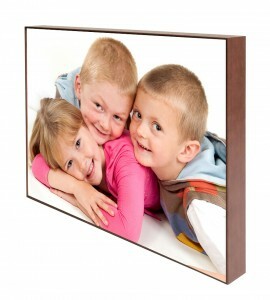 The Cubit frame in this offer is black but you can change to any of the other frame colours for a small surcharge. The Photo shoot is normally priced at £45 and the 20×16″ Cubit is £360 – so you’ll be saving a massive £270! Nab it now. There are only a limited number at this very special price. When they’re gone, they’re gone! One voucher per person/household, additional may be purchased as gifts. Voucher is valid for one month and may not be used with any other offer or promotion, or with a sitting that has already taken place. The photo shoot is available on a Tuesday, Wednesday or Thursday but may be upgraded to an evening or weekend for a small surcharge.